iTunes 12.7 appeared Tuesday following Apple’s slate of product announcements, and its version number hides how much that’s disappeared and changed in this release. The iOS App Store is wiped out, as are ringtones. iTunes U and Internet Radio have moved locations. And iTunes for Windows lost its ability to manage books in iOS. The first time you launch iTunes 12.7, it gives you this hilarious bit of fluff about the changes made. While many people have argued iTunes’ feature creep over the years had made it an increasingly odd sack of unrelated items, this shift doesn’t come with commensurate improvements or additions elsewhere in macOS, and may cause some difficulties for people with modest Internet throughput or low bandwidth caps, which can affect people across both the developed world (more the U.S. than elsewhere) and the developing one. The biggest hit is to the iOS App Store in iTunes, which was always a strange fit. iOS apps were in iTunes, because iTunes was once the only way to manage content. But you’ll have to adjust your behavior and find new places to carry out activities you might have before. Let’s go through the changes. The App Store in iTunes is kaput and there’s nothing you can do about, so dry your tears and let’s move on. Apple doesn’t let it go neatly out the door, however. After updating, I found that 5GB of “.ipa” files—the file format for apps—remained in my home directory (in ~/Music/iTunes Library/Mobile Applications/). You can throw those away unless you’re nostalgic. If you were used to syncing your apps via iTunes and making purchases in macOS to sync back, that capability is now restricted to iOS. You won’t consume more bandwidth downloading an app via iOS than macOS—unless you have multiple iOS devices syncing the same apps to a single Mac. Where it will really hurt is if and when you need to restore an iPhone or iPad. You can still perform iTunes backups, but the restore won’t transfer apps from your Mac, but instead re-download them over the Internet from Apple. That can easily consume gigabytes of bandwidth, depending on your app choices. Many users download few apps, or those apps that are relatively modest, and this won’t be as big a hit. There’s no way to bypass or minimize this problem. If you have any kinds of restrictions on your internet service—whether in performance or limits—you should consider using a public Wi-Fi hotspot or the Wi-Fi of a friend without those limits. You’ll need to plan ahead when you wipe and want to restore an iOS device. 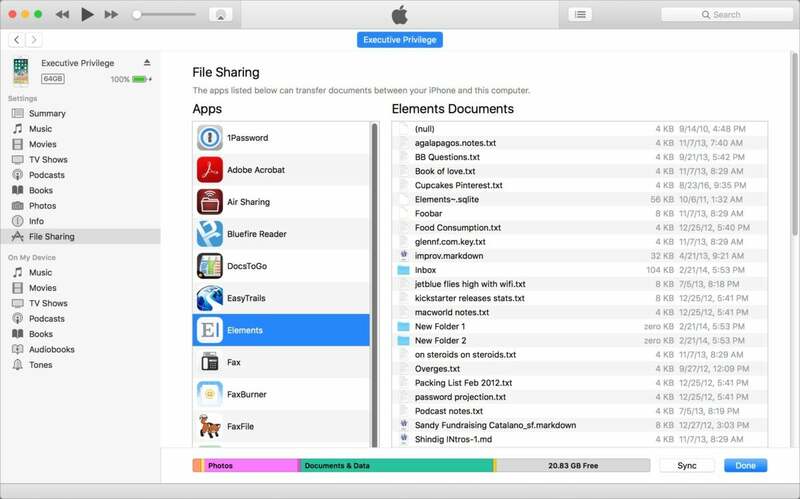 You might wonder what happened to File Transfers, a hack that Apple introduced many years ago to allow iOS apps to sync data back and forth with a Mac before iCloud Drive, Dropbox, Google Drive, and other methods were readily available. It remains: with an iOS device connected, click its icon in the area below the playback bar, and then click File Sharing in the navigation list at left. File Transfers remains, even though apps are gone. Ringtones are no longer managed as purchases in iTunes, but you can find previously downloaded ones and manage those in iTunes. 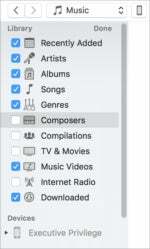 Apple says any downloaded ringtones are in the ~/Music/iTunes Library/Tones/ folder. And if you select your device in iTunes, you can click the Tones item under On My Device to remove and add them. In iOS 11, coming shortly, Apple will let you re-downloaded previously purchased ringtones and manage them directly on the device. You can pick what shows up in the music library sidebar, including Internet Radio.